After a mixed start in July and a fantastic August, how did the Each Way Betting experiment fare in September? So, as you can see, September proved to be yet another storming month with returns of 48.6% on the month, bringing home a whopping £343.76 in profits. Overall, that’s a cumulative return of 107.5% …. Yes, that’s right! The starting bank in July of £506.78 officially doubled to £1,051.42. September proved to be the most active month to date with 270 total bets placed across 22 days. That’s an average of around 12 bets per day, which remains consistent with previous months. In total, I turned over £1,256.50 through my chosen bookmakers, yielding a 27.4% return on investment for the month. The best day’s profits for the month was £82.66, and the worst down day was -£26.50. This meant that our average daily profit for September was a healthy £15.63. In contrast, the low for the month was £747.09, which was our starting position for the month, which we never dipped below on a day’s basis :-). Once the monthly OddsMonkey subscription is deducted, that left an overall profit of £325.77 (or 46.03%) for September…. pretty decent I have to say! To date, 710 total bets have been placed across 58 days. That’s an average of around 12 bets per day. In total, £3,397.10 has been turned over through my chosen bookmakers, yielding a very decent 16.03% return on investment. The best daily profit overall is £98.50, and the worst down day was -£66.52. This meant that our average daily profit is running at £9.39 overall. 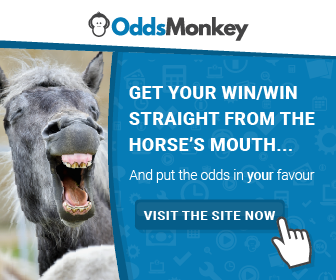 Once the monthly OddsMonkey subscriptions are deducted, that’s an overall profit of £490.67 (or 96.82%). Having maintained a 1% risk of starting bank from the beginning (£5 per bet, split £2.50 each way), the time has come to recalibrate our bet size to £10 per bet (£5 each way). This still represents roughly 1% of our current bank of £1,000. As our profits rose, the bet size remained fixed so, in effect, our risk per bet was dropping lower and lower to 0.5% risk per bet by the end of September. In order to keep our profit potential high, but cap risk to 1% bets, our bet size needed updating. From, here, rather than increasing this with each day’s balance, I will again wait until such point comes where our bank doubles again to £2,000 before upping to £20 per bet etc. Introduction of multiples – nearly all of my bets to date have been single bets (i.e. 1 horse outcomes – they either win or place or lose). I’ve started to throw in a few (reduced odds) multiples, where you combine single bets together for a potentially higher payout. I’ll be doing more of these doubles (and even trebles) when the opportunities arise. Redistribution of profits – the profits to date have come in different proportions from different bookmakers. To ensure I’m well funded to keep capitalizing on opportunities across all the bookmakers I use, I’ve redeemed some profits from those with high balances to top up those with lower balances. So, I look forward to what October can bring with higher stakes. I think it will be unrealistic to achieve 45-50% returns every month so I’m cautious on that front staking larger amounts, but equally, I do not know for how much longer the run can continue before I get restricted with certain bookmakers so I’m determined to rinse as much out of this as I can. What about you? Are you having any success with Each Way Betting? As always, I’d love to hear your thoughts or questions below. Wow, those are some impressive profits! I really need to get started with EW betting, this makes four different blogs I’ve seen that are making some good money from it. So far I’ve just been working my way through the signup offers of various bookies and doing the occasional reload offer.